So as most of you know I took a Dramaturgy course in Milan this semester. Our class finished up on Monday, and we had our final on Tuesday. This final was unlike any I have had in my four years at New Paltz. 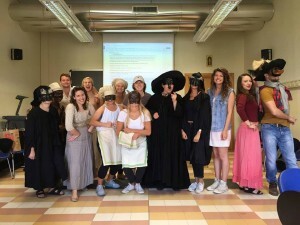 We as a class had spent our semester writing a play, in true commedia dell’arte fashion. We had two professors for this class: Laura & Stefano. 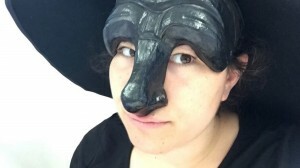 Laura spent the first half of the semester teaching us the history of commedia dell’arte. Laura also helped us to write our scenes. Luckily for me, someone who has never written a play before, we were able to work in groups. With the help of Stefano we brought the words to life. This was a long process. We went through many drafts, many opportunities for editing. Just when we thought we were done, there was always another change to be made. Stefano made cast decisions, and then for the second half of the semester we blocked and staged our production. I was cast as Il Dottore, the heavyset, old, know-it-all man. This was quite the humorous role for me. I have done a lot of theatre in the past, but I must say I have never done anything in the style of commedia dell’arte, so this was a first! My mom actually sat in on the class a few weeks ago, so that she could see what I was up to. Needless to say, seeing us all in the masks, she got quite a kick out of it. And with this my friends, I am done with classes, and in full finals mode! Tomorrow I have the end of year celebration and then I am actually off to watch Stefano perform in a commedia dell’arte play at Piccolo Teatro! Till next time! Keep practicing those lines, and those lazzi! Next ArticleFinal Stop: Austria & Germany!